I love long weekends. I particularly love long weekends like the one just ending--those that consist of me doing absolutely nothing. I think I may have grown roots to the recliner the past few days what with all the knitting and reading I've done. It's been bliss, let me tell you. I could get used to this life. Poor husband and daughter didn't have it so good. He spent the past few days digging out sprinkler system do whatsies trying to fix them. He's still not done, but I think he's making progress. The lawn is crunchy, so I'm sure that it will be beneficial to get teh sprinkler system back on line. Daughter has spent her weekend studying for finals. Her exams start tomorrow and go through Thursday. I know she's looking forward to having those behind her. I'm really proud of the effort she's put into studying and making sure she's ready for her exams. I'm working on a Green Gable for myself in bright blue Cotton Ease (stashed from when Lion Brand discontinued the bright colors) and the Forest Canopy Lace Shawl is still in progress. I'll try to get photos this week. The Little Silk Shrug (in Cotton Ease) is finished! I'm quite pleased with the results, but more importantly, daughter loves it! I think it will look fantastic with the dress she's wearing next week--and yes, there will be photos of her wearing the new dress and shrug combination. Here are a few quick shots of the shrug to tide you over. I used just a little over 1 full skein of Lion Brand Cotton Ease. I followed the pattern as written--including the recommended needle sizes--with the exception of slipping the first stitch of each row. The finishing border around the top and bottom edges of the shrug have you picking up stitche and then knitting and purling. I hate picking up stitches from raw edges. I think it's part of my perfectionist personality. It was much easier having the slipped stitch "chain" through which to pick up those stitches. As always, I was thinking of modifications for the shrug the entire time I was knitting! I'm pondering doing a similar garment with ribbed sleeves (knitted in the round) but the same lace pattern for the "body" of the shrug. I never have understood why so many shrug patterns are written as knit flat. I'd rather knit in the round and avoid the seams! I didn't know how hard it was to match whites until I tried it this weekend. 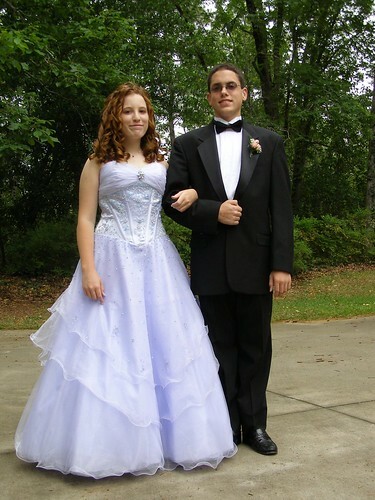 Daughter's 8th grade honors night is coming up, and she has a new dress for the occassion--a strapless sun dress. Daughter's dress has a snow white background with a bright teal print. Even yarns that look snow white sometimes are not! Everything in my stash was "natural" color which equates to cream. I checked the LYS and they did not have anything suitably white, so off to Michaels. I came home with a Wool Ease in white and Lion Brand Cotton Ease that was even brighter white. The Cotton Ease matched the best, so I'm about half way into the Little Silk Shrug from Lace Style. The pattern is so easy! The Cotton Ease is nice to work with, too, and I think it shows off the stitch pattern very well. I'm still plodding along on the Forest Canopy Shawl in laceweight, but the shrug has taken priority. You know how it is with those deadlines looming!! I need to finish the shrug by next Thursday which should be no problem at all. We are having little visitors in the yard now that the weather is warm. Here's one little guy who's been sunning himself on our deck. 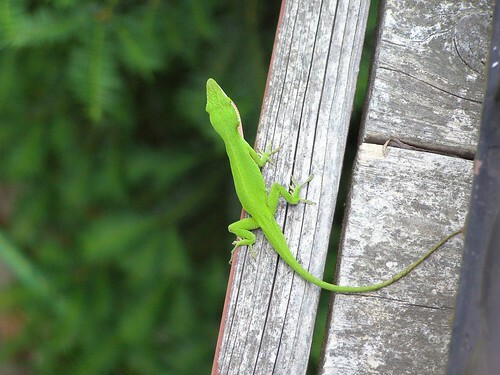 This is a green anole. We've also seen some Eastern Fence Lizards running about. This gorgeous flower came up on its own in one of the flower pots on our deck. 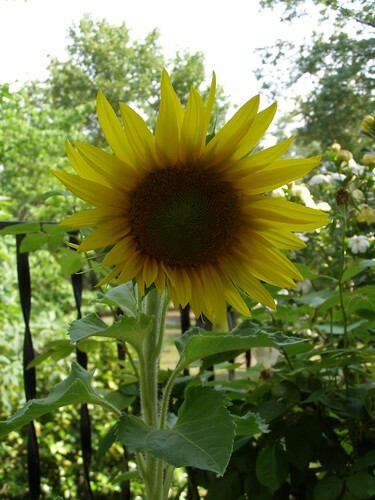 We didn't plant sunflowers, so I'm thinking that maybe a bird dropped this seed. Isn't it pretty? I'm the proud owner of a new Woolee Winder and bobbins for the Lendrum thanks to Amanda's house cleaning. She wasn't using the WW and decided to liberate it. Thanks, Amanda! We have three Lendrums in the family, so I'm sure this will get lots of use! I hear all the cool kids are in Ravelry, and I want to play, too! Please? Pretty please? Anyone have an invite to spare? I'm still plodding along on the Forest Canopy Shawl. So far, so good. Lifelines are a girl's best friend. Diamonds run a close second! I am still way in love with the Knit Picks Shimmer. It is so squishy and yummy and light as a feather. I cannot wait to get my shawl finished!! 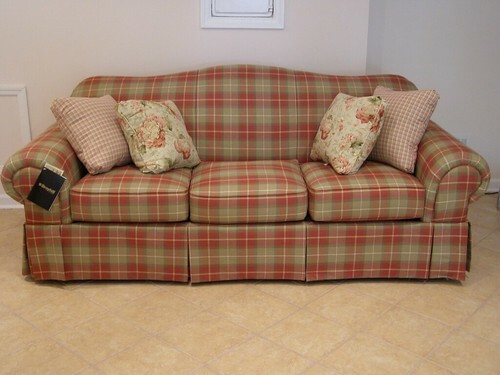 A couple of months back, we ordered a sofa for our sun room. It came today!! I'm really pleased with it. The colors go well with the tile and paint color. I stretched out to test the comfy factor, and this sofa is indeed comfy. 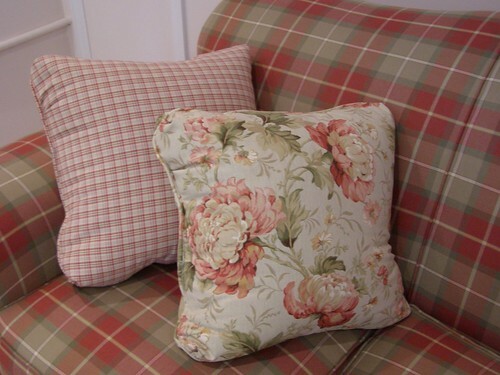 Here's a shot of it and a close up of the pillows. Did I mention that the sun room is now chicken free? The chicks are enjoying their larger pens, fresh air, and room to scratch the ground. We've been visiting with them every day, and they are all fairly tame. Some like to be held more than others! The bunnies are doing well. Miss Phoebe gave me a fright this week. She was just very quiet and still. I think that's because she's getting older--around 5 years old. Maybe she's pouting a bit because of Isabella Bunny coming into the picture! Phoebe is back to her old self today, thank goodness. Husband says Isabella is a bad egg. How could anything so sweet an innocent looking be a bad egg? Hmm...could it be because she flips her feed dish over and rests her front paws on the overturned dish? Could it be because she pees out the corners of her cage? Husband even says she sticks her cute little pink tongue out at him. I don't believe a word of it! :-) He claims she behaves in front of me because I'm her mom. This one is making the rounds, and I have nothing else to post today, so....meme away. Bold for stuff you've done, italics for stuff you plan to do one day, and normal for stuff you're not planning on doing. I had a wonderful, relaxing Mother's Day yesterday. I even managed to squeeze in a very short nap before anyone missed me!! I didn't knit a stitch this weekend. I just wasn't in the mood. I managed to run a second life line in my Forest Canopy Shawl, so I'm ready now to begin another pattern repeat. One life line after each repeat is the new order of business for this shawl. My new bunny has a name now; meet Isabella. I can't seem to get a picture of her that isn't fuzzy. Could it be because she is in constant motion? Phoebe and Isabella met each other yesterday. All was going well until Is decided to jump across Phoebe's back. Have you ever heard a rabbit growl? I have, and it was a little scary! I think Phoebe believed she was being attacked. We'll get the girls together again, but only under close supervision. Here's a photo of Phoebe. This girl knows how to take life easy and hold still for pictures! Husband (with Daughter's help) spent a good bit of time Saturday and Sunday constructing a chicken yard. The bigger chicks will move out of the chicken tractor and into the new yard. The little guys that are inside are going to be taking up residence in the tractor. I cannot wait to get the birds out of the sun room! I'm tired of sweeping up feathers and poo! I am sure they'll be happier outdoors, too. EVENING UPDATE: The chickens have all moved into the yard! Yahoo! Everyone is very happy about this living arrangement. No...not the kid! I've had her for a long time. 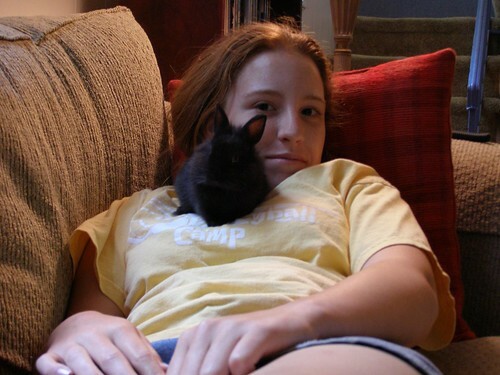 The tiny little black thing perched on Daughter is my new little baby. She does not have a name yet, but we're working on it. 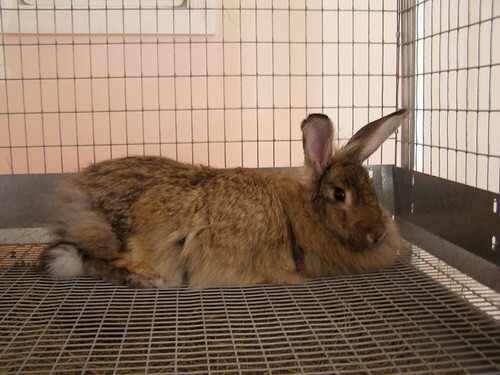 She's a Lionhead rabbit. She is so tiny and so sweet. 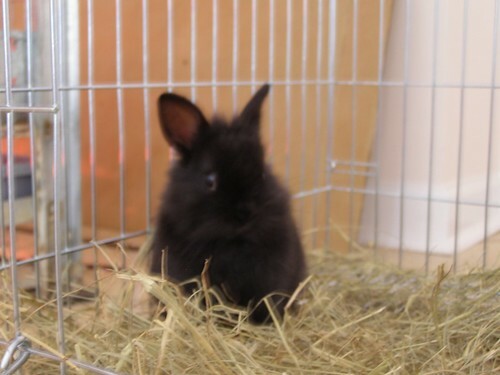 Lionhead's don't get much bigger than 3 3/4 pounds, so she'll be small when she's full grown. Yep. You gotta know when to say enough is enough. 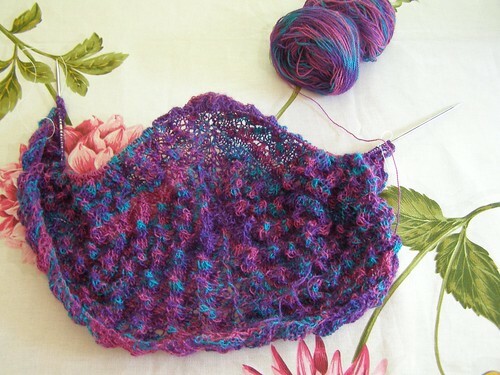 Real knitters are not afraid to "rippit." Do you see where this is going? Lace? Forest Canopy Shawl? The project that does not want to be? I ripped out the entire shawl yesterday afternoon and started over. It was beyond repair. I am starting to think that beautiful yarn is cursed! It just does not seem to want to be anything but a center pull ball. I did cast on the shawl yet again and have completed two pattern repeats. The stitch counts are just right. Everything looks good....for now. I'm running a life line after every pattern repeat from here on out. We had some unpleasant excitement last night. Husband got rear ended. He seems to be OK--some pain in his neck and back which he is going to have checked out. The car looks alright from the outside, but the bumper is pretty messed up underneath. People drive like idiots around here. I'm just thankful this accident wasn't worse. Finally, a comment on comments. Because of an asshat spammer, I'm turning on comments moderation. I hate to do this, but I'm not going to let a spammer take over my blog. My little hamster, Sable, died yesterday. She had a long and hopefully happy life, and for that I am grateful. Sable was two years old which is old for a hamster. Her cage was here in my home office, and I enjoyed seeing her scampering around during the day. Hamsters are nocturnal, but Sable would always make a mid-morning appearance for a drink of water and a snack. She also scratched around a lot in her sleeping area and sometimes made little grunting noises. Sable was a good hamster, very sweet and loving. She had the cutest little pink toes, a wiggly nose, and soft hair. I will miss Sable. We buried her in a little gold "coffin" in the edge of the woods next to daughter's hamster Sweet Pea. 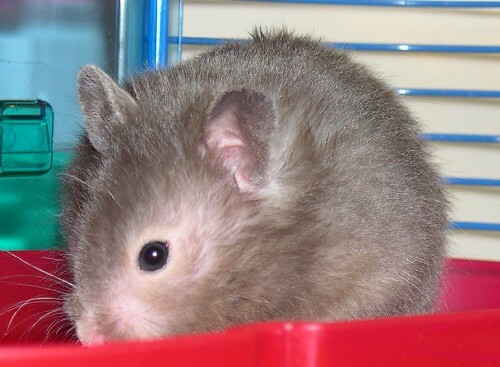 Here's a photo of Sable as a young hammy. In knitting news. URGH. The lace and I had a little falling out last night. Falling out = dropped stitches = ripping out = URGH. Thank goodness for lifelines, but why didn't I use more of them? I lost half the shawl, but that is better than losing the whole thing. Once again, I battled the shawl and this time I won! I have no idea where the mistake was, but I ripped back about 10 rows, re-knit them, and am on track in terms of stitch count. Yay! Joan asked in comments about sock knitting using a 12 inch circular needle. 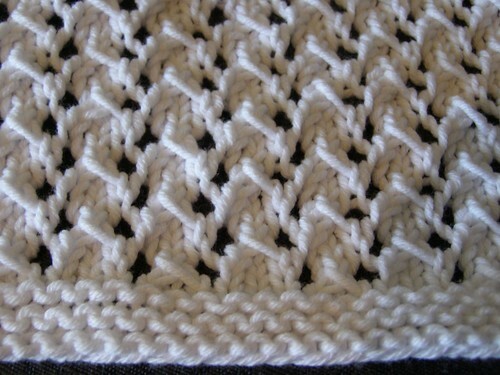 Yes, this is the method I use when making a "plain vanilla" stockinette stitch sock. I typically will cast on with DPNs and knit a bit of the cuff to get started just because that's easier for me. I also switch to DPNs for the heel and toe. I'm not yet proficient in using just the 12 inch circular, but I've read around the 'net that some people do use the small circular needle for the entire sock. I just like using the circular because I can zip out a sock in a day or two. It takes me a little longer on DPNs. If I'm doing patterning, I find the DPNs easier because of the sharper points. My SP left a comment a couple of days ago. Still packing the box? Gracious, woman! Are you sending me a yarn store?? :-) I cannot wait to find out who you are! You've been very generous and kind during this round of SP. I know you have to be a very special person. Somewhere in this blob of lace, there is a mistake. I cannot find it. I've ripped out the last pattern repeat at least three times, reworked it, counted stitches, and still...the error is there. It is making me nuts!!!! For any of you familiar with the Forest Canopy pattern, you know that it's an 8 row pattern repeat. It's a fairly simple pattern. I had no trouble whatsoever working this in sport weight Mountain Colors, but now that I'm venturing into laceweight, the goddesses of knitting have turned on me! I keep coming up with one extra stitch on row three in this particular pattern repeat. I've made NO progress whatsoever with the shawl in the past two days. I will prevail, though. I'm determined. I'm also very much in love with this yarn. I checked, and it is Shimmer from Knitpicks. It is so soft and springy. It also has a nice shine to it. 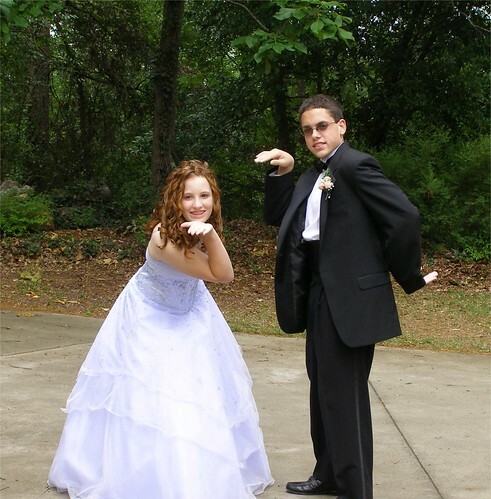 Spring Formal has come and gone, and a wonderful time was had by all! We've been in a whirlwind around here just getting ready for the big event, so we're breathing a sigh of relief that it's done and that it was great! Daughter and her date looked fabulous of course! They really look nice all dressed up. Here's the dignified pose. And here are the fun-loving little jokers we know and love.